Police are being mowed down in an alarmingly rate this year I think. 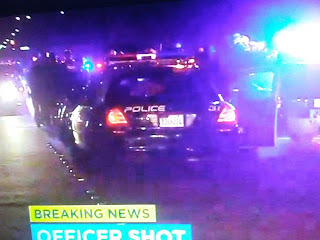 NY Daily News reports one police officer was killed and another was wounded on Friday night by a suspect who barricaded himself in a home in California. Police in Pomona, about 30 miles outside Los Angeles, received reports of a barricade situation around 9:10 p.m. Dozens of cops responded to the 1400 block of South Palomares Street, and two officers were shot before midnight, according to Police Chief Michael Olivieri.